A college student named James shared with me how thankful he was to quit his job at Toys-R-Us. This was years ago, before bankruptcy threatened the company, and though this one kid's story likely played no significant role in Toys-R-Us shutting down, recent headlines nevertheless brought the memory to mind. “It was a terrible work environment. I couldn’t wait to get out of there.” I have had a few terrible jobs myself, so I commiserated with him. I was also curious about what led to the decision. This only furthered my questioning, so I dug in. As a backpacking guide, I often take people into unforgiving environments, which means I get to witness breaking points. Storms, sounds in the night, conflict, fear of being known--any of these and more can take a person over the edge. Some participants last for miles without a peep. Others crack at the slightest threat. I wanted to know why this kid broke. Okay, so Toys-R-Us didn’t work out for him. I logged it away and changed the subject. “What are you studying?” I asked. “James, do you mind if I push a little? You said you want to change the world through business, but you just quit your part-time job at a toy store, which is a business.” I tried to say this caringly, but you can imagine my tone as I over-emphasized the obvious. He asked me to continue. No. No to every question. He - and each of his friends who worked there at the time - simply walked out. James was young, and quite sincere as he confessed such a huge miss. He realized that his action and inaction would not help that old boss become a better boss, nor would it protect future Toys-R-Us employees. Furthermore, it would not teach James how to work through difficulties. If he quit this easily here, would he quit this easily at the next place, and the next place, or in his marriage, or at his church? What did his fantasy of changing the world through business actually look like? We all know of valid reasons to quit. Work has been affected by the Fall as much as everything else. It is true, there are terrible bosses in the world. But is it possible that by letting their terribleness affect us, good could result? By feeling the terribleness, at least for a time, I might become more aware of the pain it causes others. I might discover compassion for the boss whose private burden has so many professional consequences. This patient waiting gives me time to observe, to create a plan, to seek outside advice. It grants courage to try to change that little corner of the world called my workplace. And though I do not have the power to stop terribleness by sticking around, quitting early - before it is truly terrible - makes me an accomplice in whatever terribleness that bad boss might perpetuate in my absence. Sticking around proactively, even for just a while more, marks the difference between searching for the perfect job for me, and shaping the current job for others. One is self-oriented; the other is for my neighbor. My prayer is that James took that missed opportunity and turned it into work that does what is hard for the sake of what is right. This is never the easy road. It disrupts comfort, it threatens the ease we otherwise may be tempted to pursue. But it also leads to growth. It matures us and converts us. It might get us fired or bring us to tears, but when done with love and grace and vision, who cares? It’s always better than just walking out. Sam Van Eman is the author of Disruptive Discipleship and On Earth as It Is in Advertising? Moving from Commercial Hype to Gospel Hope. He is a resource specialist for the CCO’s Experiential Designs team, where he co-creates transformational experiences for college students, professionals, and organizations. As a public speaker and facilitator, Sam has taught (and played) in barns and boardrooms, canyons, classrooms, and auditoriums. His years on campus resulted in numerous Christian Service awards for his student leaders and a Greek Life brotherhood award named in his honor. 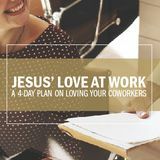 He has contributed to PRISM Magazine, the Center for Parent/Youth Understanding, Christianity Today’s Faith in the Workplace, and was highlighted in the decade’s best at Catapult Magazine. He lives with his wife and daughters in central Pennsylvania. Enjoy the long weekend! But you know that you're going to have to face the boss again on Monday. By Sam Van Eman. Published by The High Calling, August 16, 2018. Image by Tim Miller. Used with Permission.